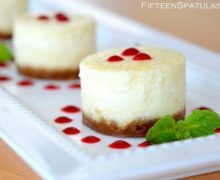 These creamy mini cheesecakes have a buttery gingersnap cookie crust and a tangy raspberry sauce to offset the richness of the cheesecake. It’s a great make-ahead dessert! When I see mini cheesecake pans at the store, I always laugh to myself a bit because it just seems so silly. There are already too many kitchen items available and not enough room in the average kitchen (or at least, there’s not enough space in my kitchen). I make my mini cheesecakes by baking off an 8×8 square pan (no leaky springform pans to deal with) and using a cutter to cut the cheesecakes out. And as you can see, they come out pretty darned gorgeous. I also have a hard time deciding whether to do a chocolate ganache or raspberry sauce when I make these, but given the richness of cheesecake, the raspberry sauce usually wins. 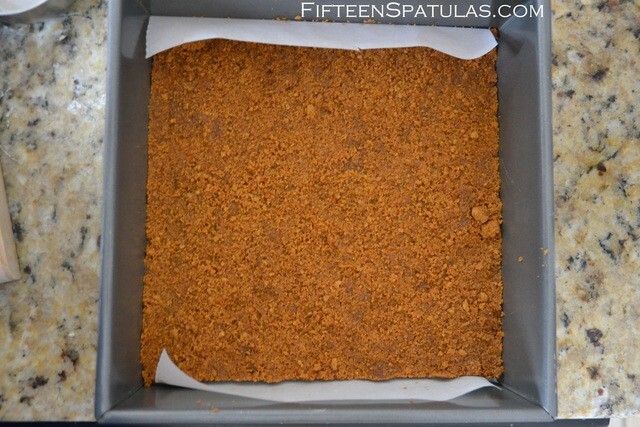 For the crust, mix together the ground gingersnap cookies and melted butter, then press it out into an 8×8 pan. For the filling, start by beating together the cream cheese and sugar until combined. Add the eggs, milk, sour cream, and vanilla, and flour. Pour the filling into the crust and bake in a water bath. 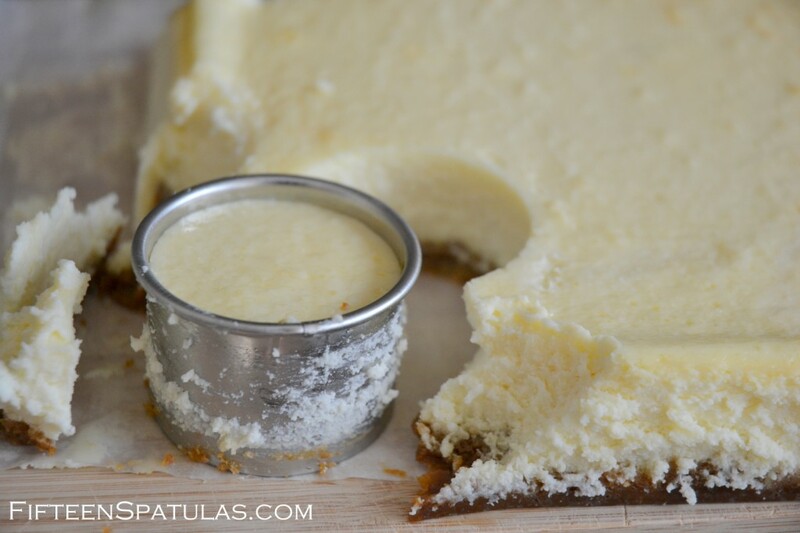 Refrigerate the cheesecake and start cutting out circles with a biscuit cutter. Use your fingers to gently push the cheesecakes out onto a platter. 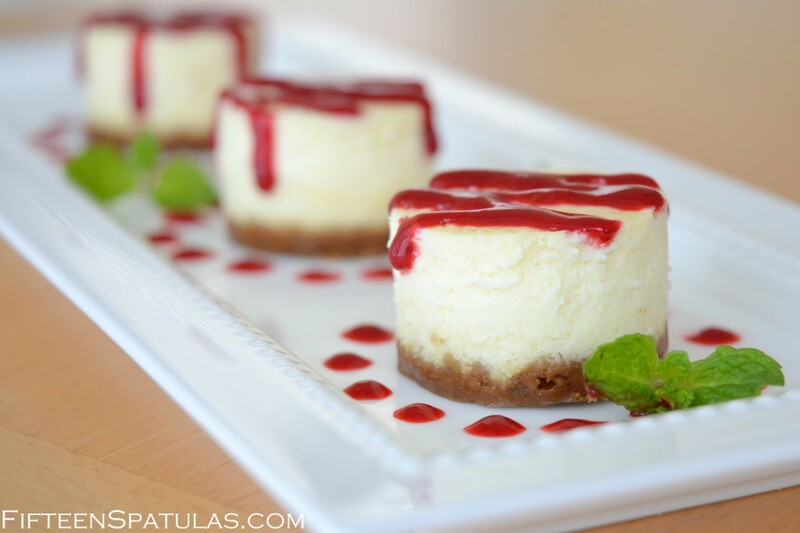 These creamy mini cheesecakes have a buttery gingersnap cookie crust and a tangy raspberry sauce to offset the richness of the cheesecake. It's a great make-ahead dessert! Preheat the oven to 350 degrees F. Line an 8×8 pan with parchment paper. Mix together the ground gingersnap cookies and melted butter, then press it out into the 8×8 pan. Using a mixer (or if you used a food processor to grind up the gingersnaps, just wipe that out and mix in the food processor), beat together the cream cheese and sugar until combined, and don’t mix any more than you need to since that will incorporate unwanted air bubbles into the cheesecake. 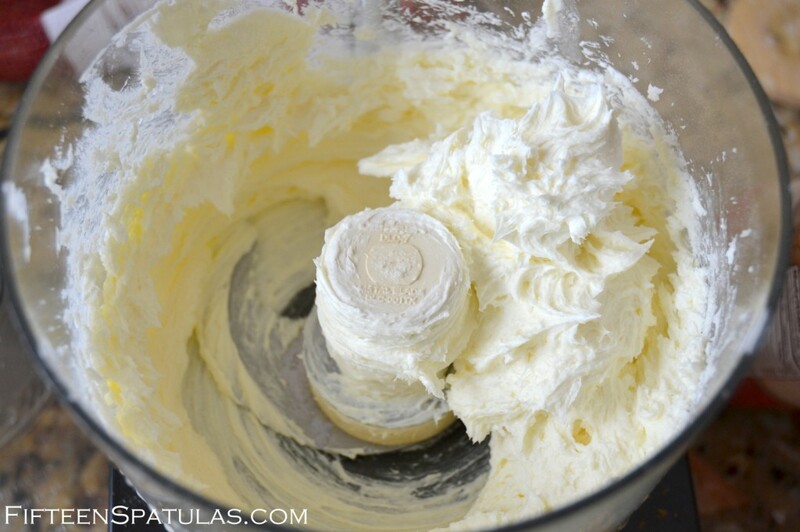 Add the eggs, milk, sour cream, and vanilla, and mix until combined. Add the flour, then mix until it is distributed. Pour the filling into your pressed out crust, and drop the pan flat on your countertop a few times to try to get a few air bubbles out of the batter. Place the 8×8 pan in a larger 9×13 dish and fill the dish halfway up the sides of the cheesecake pan with boiling water. Bake the cheesecake for 50 minutes, until the cheesecake is jiggly but still set. Turn the oven off, and leave the cheesecake in the oven with the door cracked open until the oven has cooled to room temperature (this helps the cheesecake come down to temperature slowly, which prevents cracking). Remove the cheesecake from the water bath and place in the refrigerator until completely chilled. 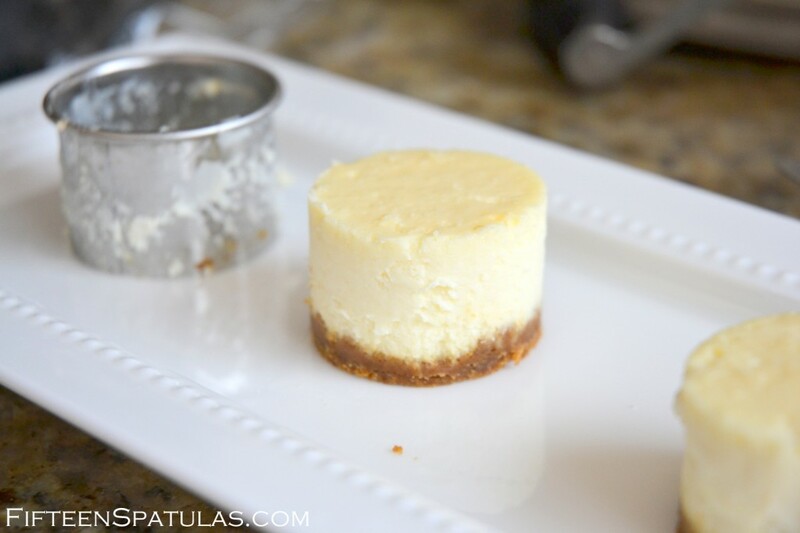 Then use a biscuit cutter to cut out your mini cheesecakes. 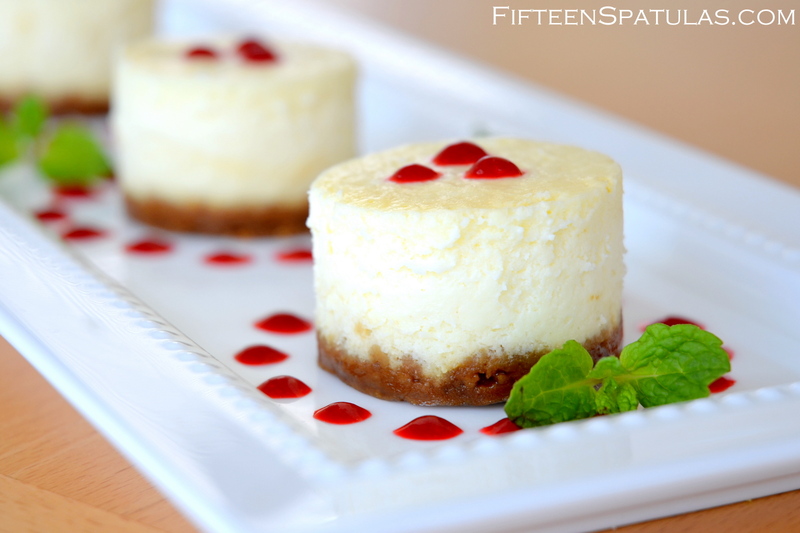 Use your fingers to gently push the cheesecakes out onto a platter. To make the raspberry sauce, combine all ingredients in a saucepan over high heat and cook, stirring constantly, for 5 minutes. Strain the seeds out if desired. Do you think you could push them out if the cheesecake was crust-less? I want to stack it on another piece of cake to make a tiered effect. Hi Julia, definitely. That won’t affect your ability to push the cheesecake out of the cutters.